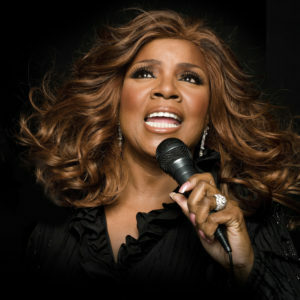 WILL SURVIVE WAS RECORDED IN 1978, AS GLORIA GAYNOR’S TALE OF PERSONAL STRENGTH AND WAS SOON TO BECOME THE GREATEST DISCO ANTHEM OF ALL TIME. (Gloria was in a back brace when this song was recorded!) In 1979, “I Will Survive”climbed to the top of Billboard’s Pop Charts and claimed the #1 position on two different occasions. Little did Gloria know, the song would grow into the banner for social survival which is still relevant after three decades of international airplay. The song itself has survived and has been re-recorded over 200 times by accomplished artists such as Gladys Knight, Chantay Moore, Diana Ross and Cake. NOW, MORE THAN 30 YEARS LATER, GLORIA CONTINUES TO SET THE STANDARD – Gloria’s popularity continues to flourish into the new millennium. In March of 2001,“Just Keep Thinkin ’About You” topped the Billboard Dance/Club Charts at #1, while Gloria’s international hit “Last Night” with Giorgio Moroder debuted at #1 throughout Europe. Gaynor was also the first artist to record an album especially for clubs, and the first to do a mega extended dance medley party mix, releasing 12” dance singles that are now high-end collector’s items.In 2002, Logic Records/BMG released the highly anticipated U.S. LP entitled “I Wish You Love”. That was her first worldwide release in 15 years. It gave birth to 4 #1 dance singles on Billboard’s Dance Charts and “I Never Knew” (radio version) made the top ten on Billboard’s Adult Contemporary Charts. She also recorded a new version of “I Will Survive” in Spanglish, recorded live in Brazil. While touring Gloria completed her bachelor’s degree in Psychology. Her plans for the future include opening a healing, learning and recreation center for teenage parents in her hometown of Newark, NJ. 2013 promises many exciting opportunities ahead as Gloria movies forward, her journey continues to unfold as she proves to the world how she not only is continuing to survive, but living that life in abundance!